Dimensions (HxWxD): 16" x 11" x 19"
The Swingline™ EM07-06 is an executive level micro cut jam free shredder intended for environments where data security is a prime concern. EM07-06 is a level-4 shredder and yields a micro cut particle size of 1/8 inches-hence making data reconstruction almost impossible! The EM07-06 micro cut jam free shredder is super quiet in its operation and can slice through both staples and paperclips. It has a 9 inch wide throat size and can shred 7 sheets at a time through the top loader. Swingline™ EM07-06 can shred at the speed of 7 feet per minute and also comes with a Jam clearance feature that keeps the shredder free of any paper jams! This micro cut shredder has a compact yet stylish outlook and thus saves you space by snugly fitting under desks. EM07-06 comes with a waste bin size of 6 gallons. 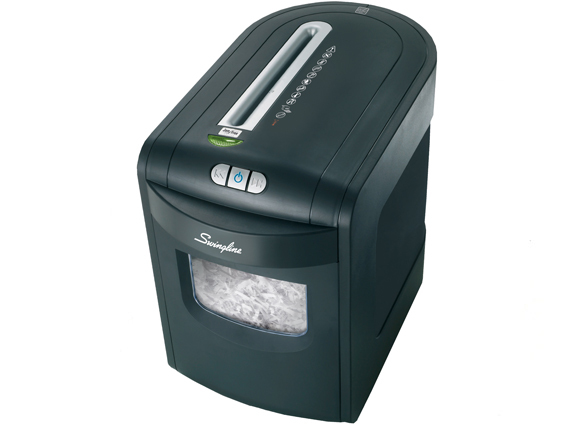 The Swingline™ EM07-06 jam free shredder is perfect for securing confidential data.